A $340,000 “Angelmobile” has started cruising the streets of North Brooklyn, handing out free meals in Williamsburg, Greenpoint and Bushwick. The state-of-the-art food truck– funded in part by Norman Brodsky, the entrepreneur who drew ire from community activists when he held out on selling his valuable waterfront property for parkland— is more than just a mobile soup kitchen. Inside, it has an office space where a rotating array of neighborhood organizations can dole out social services. After 60 days on the table, the city’s offer to pay the former CitiStorage site’s owner $100 million for the final parcel of the long-promised Bushwick Inlet Park has officially expired. With Norman Brodsky’s default rejection of the offer (less than half the $250 million he was hoping for) questions emerge as to whether the Williamsburg waterfront park—which was first promised in 2005 as part of a rezoning deal that allowed for more high-rise developments in the sought-after neighborhood—will ever be completely finished. 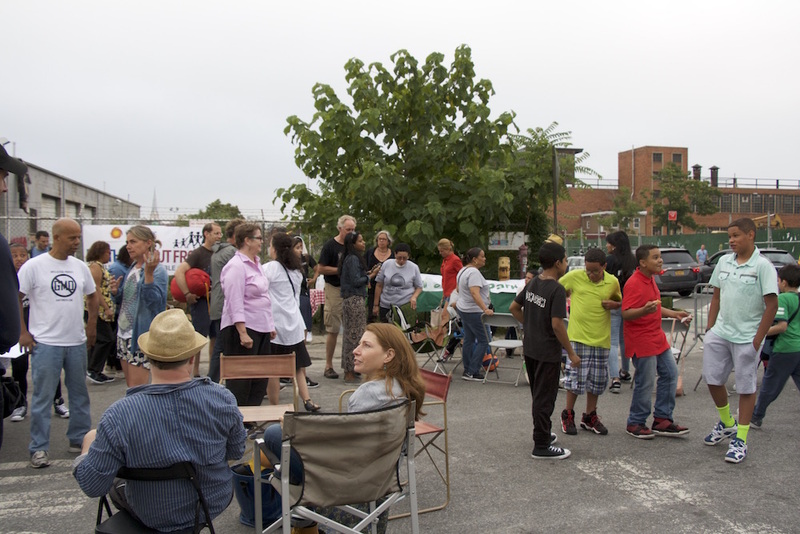 On Saturday evening, about 40 neighborhood activists and elected officials braved the ominously dark clouds in the sky and gathered on the concrete slab adjacent to the massive CitiStorage site on N 12th and Kent Street. Armed with sleeping bags, blankets, warm clothing, snacks, lawn chairs, and a banner proclaiming “Where Is My Park?”, they had one in-tent: to get property owner Norman Brodsky and the city to reach a deal to turn the property into parkland, once and for all. Last month, the city made a $100 million offer on the final parcel of land needed to complete the long-promised Bushwick Inlet Park along the Williamsburg waterfront, giving the property owner 60 days to take the money. The owner, Norm Brodksy, promptly declined the city’s offer and now appears to have set a deadline of his own. Nearly a year after a seven-alarm fire ravaged the CitiStorage building in Williamsburg, the fate of the hotly contested land remains in limbo. On Sunday, the fire’s anniversary, Friends of Bushwick Inlet Park will gather to once again call on the city to turn the controversial plot into parkland. Halloween came early for a developer seeking to take over a controversial plot on the Williamsburg waterfront; this afternoon activists hauling coffins and headstones tried to spook Midtown Equities out of building on land once destined to become a park. Williamsburg activists are strengthening their calls for the city to acquire the site of a massive storage-facility fire even as the prime waterfront land has reportedly been optioned to developers. When a seven-alarm fire broke out at his Williamsburg storage facility early in the morning of January 31, Norman Brodsky didn’t just lose his office – he also lost his home. Since then, he has spent his days finding a new place to live, replacing clothes and other essentials that were lost to the fire, and assessing the damage.